From the beginning, STAND has been student-led, not only at the campus level, but also at the national level. This year, STAND is offering a new way of engagement through our issue-based action committees. These committees aim to educate young people on issues related to a specific issue or conflict area, center voices of affected populations, and provide spaces for movement-building and political activism on each given issue. 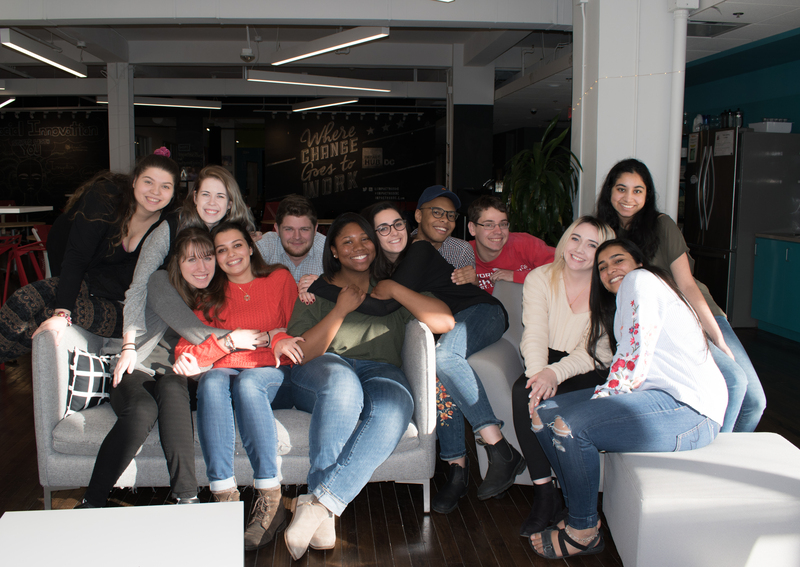 Members of our student Managing Committee (MC) serve as liaisons between Action Committees and STAND’s Student Directors and at-large MC members, helping develop STAND’s national advocacy focus areas, craft our public brand and messaging, and coordinate our grassroots organizing efforts. Managing Committee members work closely with Action Committees to develop our short- and long-term advocacy and grassroots organizing strategies, create educational materials, resources, and activities our grassroots members, and work with partners to advance shared goals. Please note that these positions are for the duration of the 2019-2020 academic year, and require an average of 10 hours of volunteer time per week. We consider these positions to be the equivalent of a part-time internship and expect MC members to prioritize these positions accordingly. In return, and at staff’s discretion, we are happy to provide professional references and recommendations for exceptional team members. NOTE: Applications for STAND Student Director are due on April 8 at 11:59 PM EST and applications for all other STAND Managing Committee applications have been extended to April 15 at 11:59 PM EST. Contact us at info@standnow.org with any questions! As the visible leader of the STAND constituency and the supervisor of the Managing Committee (MC) and Action Committees, the Student Director (SD) makes sure all of the pieces fit together in STAND’s short-term and long-term organizational planning, campaign development and implementation, and outreach strategy. As SD, you will be responsible for facilitating internal MC discussions via Slack (our team communication platform) and weekly conference calls, coordinating workflows for the implementation of national programming, working with Staff to plan national events such as MC retreats and national conferences, and representing STAND at public speaking engagements. Working closely with STAND Staff, you’ll also play a key role in developing relationships with partner organizations and in fine-tuning STAND’s strategic plan. Click here for the application for Student Director; in addition, please send a resume and writing sample to info@standnow.org. Applications for Student Director are due on April 8 at 11:59 PM EST. Please direct any questions to info@standnow.org. The Managing Committee (MC) is comprised of STAND’s highest level activists, who oversee the Action Committees, develop national campaigns and programming, and run our outreach efforts. The MC is responsible for looking out for STAND’s long-term future, and making sure we’re effectively working towards our mission to end and prevent genocide and mass atrocities. We know MC members vary in skills and interests. Therefore, we encourage you to highlight in your application your leadership experiences, your skills and talents, and any issues we work on that you feel called to contribute to. Some MC members will be facilitating Action Committees and others will be working with SD and Staff to develop communications, partner relationships, and educational materials. In either type of role, as an MC member, you will be responsible for communicating daily with other MC and Action Committee members via Slack (our team communication platform), attending weekly conference calls, bi-weekly Action Committee calls, and creating educational and campaign materials, according to committee needs. Click here for the application for Managing Committee; in addition, please send a resume and writing sample to info@standnow.org. Applications for Managing Committee have been extended to Monday, April 15 at 11:59 PM EST. Please direct any questions to info@standnow.org. Committees are the newest way to get involved with STAND: The Student-led Movement to End Mass Atrocities. Committee members are welcomed at all levels of commitment, from those able to take one action a month, to those wanting to mobilize their communities, research policy options, and creatively fundraise for STAND’s work. You can take part in as little or as much as your schedule allows! Have an idea for another Committee? We welcome new ideas and areas of focus, and encourage you to contact us via the Committee form to pitch your idea. Click here to access the Committee interest form. After you submit, a Committee Representative will contact you with information about next steps. We accept new members at any time! Without our dedicated Task Forces, we would have no power! We are looking for state-based grassroots organizers, writers, and policy analysts to help us fulfill our goals of building an informed and engaged grassroots constituency across the U.S. Join us! STAND is looking for 1-2 volunteers to serve on our Campaigns Task Force and help us spread our message far and wide! If you’re social media savvy, enjoy thinking about visual representations of activism, and want to make a tangible difference by engaging students in human rights advocacy, this is the position for you! As a Social Media Coordinator, you would be responsible for drafting posts for STAND’s Facebook, Twitter, Instagram, and Snapchat based on the latest #genprev news, STAND campaigns, and partner actions. Additionally, you would be expected to make engaging digital graphics like infographics or call-in scripts that can be shared with STAND’s constituency to make political involvement more appealing. Our Social Media Coordinators will work closely with the Campaigns Coordinator to create social media tools for campaigns, including sample posts for activists, graphics, and other shareable content. Click here to access the application.Applications are accepted on a rolling basis.Please direct any questions to info@standnow.org. As a grassroots movement, we are working to build a community of activists in every state across the country in order to make an impact on local, state, and national policy. As a State Advocacy Coordinator, you will connect to influential grasstops and grassroots leaders in your state, plan local advocacy strategy with our Outreach and Advocacy Teams, write op-eds, lobby locally, and mobilize people in your state to take urgent actions. Click here to access the application. Applications are accepted on a rolling basis. Please direct any questions to info@standnow.org. As a member of the Education Task Force, you will form a vital part of STAND’s student leadership team. As a conflict specialist, you will draft regular news briefs on your region for our constituency; update and develop educational resources such as one pagers, blog posts, PowerPoints, and webinars; and advise the STAND Managing Committee on relevant policy points on your region. As a Conflict Coordinator, your primary duties will be to assist the Education Coordinator with the Weekly News Brief by compiling and summarizing pertinent articles related to mass atrocity situations in your region of focus; and to inform STAND’s Leadership Team on possible avenues for policy leverage on conflict(s) in your region. As events on the ground in each region are ever-evolving, you will be responsible for sending a policy brief once or twice a month to STAND’s leadership team. Within your position, you’ll act as a resource for STAND’s leadership and membership on the conflict(s) in your region of focus, by assisting in the creation of educational materials and blog posts on the history, context, and root causes of the conflict(s); the research behind possible options for U.S. policy to mitigate the conflict(s); and assistance of the Managing Committee in developing national campaigns related to the conflict(s). Background knowledge, previous coursework, and/or previous research experience related to the region for which you are applying will be helpful but not necessary. Applications for the Education Task Force are currently closed. We’re looking for activists to write quality posts for our blog and to write for local publications. As a member of the Communications Task Force, you will be responsible for researching and writing a minimum of one blog post and/or one local opinion piece per month. Each team member will work with our Communications Coordinator to expand their knowledge about STAND’s conflict areas, fine-tune their writing abilities, and producing content for our widely read national blog and other local or campus publications. Applications for the Communications Task Force are currently closed.